Book Three is sharply different from the two books that precede it. In simply formal terms, this book is much shorter, with seventeen psalms as opposed to forty-one in Book One and thirty-one in Book Two. Also, only one psalm is attributed to David, whereas Book One has thirty-seven and Book Two has eighteen. In Book Three, the first eleven psalms (Psalms 73-83) are attributed to Asaph, four are attributed to the sons of Korah (Psalms 84, 85, 87, 88), and one each is attributed to David (Psalm 86) and to Ethan the Ezrahite (Psalm 89). The much more important difference between Book Three and the other books of the Psalter is that of the most dominant theme of the book. This book represents a real crisis of faith for the people of God. That sense of crisis or at least struggle is characteristic of fourteen of the seventeen psalms. The crisis is sometimes very personal, as we see, for example, in Psalm 73. That psalm begins with an apparent note of great confidence: “Truly God is good to Israel, to those who are pure in heart.” But then, immediately, the psalmist turns to his serious problems: “But as for me, my feet had almost stumbled.” He is tempted to conclude, “All in vain have I kept my heart clean and washed my hands in innocence,” (v. 13). Here is a very personal and individual crisis of faith. The crisis atmosphere of Book Three is not primarily focused on struggles of personal faith, however. The crisis is primarily related to the whole nation of Israel. Psalm 74 begins, “O God, why do you cast us off forever? Why does your anger smoke against the sheep of your pasture?” The nation is suffering and wondering about God’s care for them. This suffering is of the most intense sort because the holy city of Jerusalem has been taken by God’s enemies and the temple has been destroyed. “They set your sanctuary on fire; they profaned the dwelling place of your name, bringing it down to the ground,” (v. 7). The promises about Jerusalem’s abiding forever in Psalm 48 seem to have failed. The themes of personal and national struggle come together in relation to the monarchy. Near the end of the last psalm in this book comes this question: “Lord, where is your steadfast love of old, which by your faithfulness you swore to David?” (Psalm 89:49) The faith of Israel, both as individual believers and as a nation, is symbolized by and is focused on the monarchy. God’s promise had been clear: David’s son would forever sit on David’s throne (Psalm 89:29, 36). The crisis of faith in Book Three centers on the apparent failure of that promise. And if that promise could fail, what other promises could be trusted? Intensifying the crisis is a recurring sense that in many ways the cause of the judgment of God is a great mystery and surprise. Is the crisis of faith in these psalms simply a crisis in the experience of Israel and therefore not very relevant to the life of the church? On the personal level, it is easy to see that Christians still go through times of great difficulty and trials. Every sufferer can relate to the struggles of these psalms. But the church also has “times of difficulty,” (2 Timothy 3:1) to face in its life before the return of Christ. At such moments, the church can ask in great distress, “Where is the promise of his coming?” (2 Peter 3:4a). Crises of faith are not absent from the church, and in those crises, these psalms can give expression to our deepest feelings. At a more profound level, this book of the Psalter directs us to Christ. The Earthly nation, the Earthly Jerusalem, the Earthly temple, and the Earthly king are not lasting or reliable. The promises of God must find their fulfillment in the new heavens and Earth, in the Heavenly Jerusalem that will come down to Earth, and in Jesus who will be the temple and the King of his people, (Revelation 21:22-26). Only in Jesus are the crises of this world finally and fully overcome for God’s people. In addition to the great theme of the crisis of faith, several subordinate themes bind these psalms together. One recurring theme is the importance of the temple as the center of worship and the meeting place of God with his people, and therefore the tragedy of the destruction of the temple. A second motif is the many enemies who have mocked, attacked, and, in some of the psalms, destroyed Israel. A third theme is the prayer for and certainty of judgment coming upon the sinful, destructive nations. The final theme, which is somewhat surprising in the context of the repeated prayers for judgment on the nations, is the expectation of salvation coming to Israel and to the nations. Several of these themes can be seen in Psalm 79. First, we see the importance of the temple as the center of Israel’s life: “O God, the nations have come into your inheritance; they have defiled your holy temple; they have laid Jerusalem in ruins,” (v. 1). Then, we see how God’s violent enemies also mock his people: “We have become a taunt to our neighbors, mocked, and derided by those around us,” (v. 4). 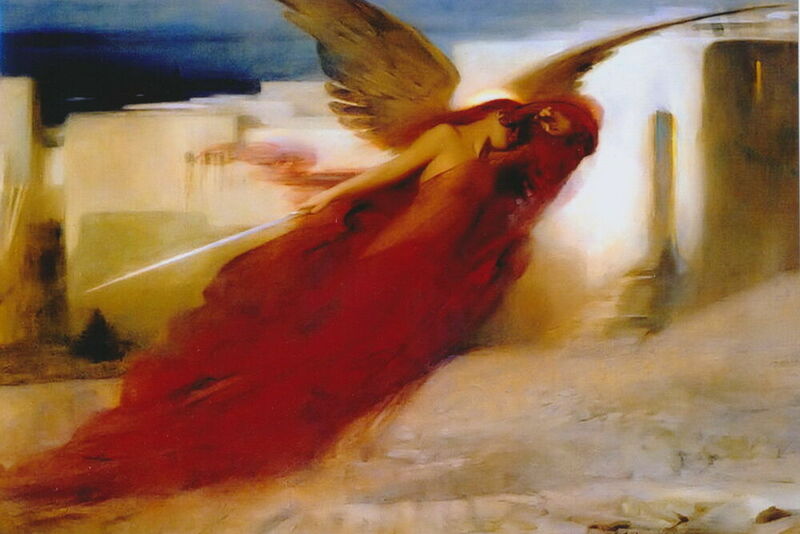 Finally, we see an appeal for judgment on the enemy: “Pour out your anger on the nations that do not know you, and on the kingdoms that do not call upon your name!” (v. 6) Only the theme of salvation coming to the nations is absent from this psalm. All of these themes help us see the arrangement and movement of Book Three. The first two psalms introduce the theme of distress and disaster for God’s people. In Psalm 73, we find a personal crisis of faith that was solved by the psalmist’s entering the temple to worship. Psalm 74 describes a time of national defeat when the temple is burned. The next two psalms speak of the Judge and the judgment that await sin. Psalm 75 looks confidently for the judgment of the wicked as Psalm 76 sees the kings of the Earth fearing the Lord. The next two psalms remember God’s redemption in the past. Psalm 77 seeks comfort in agonizing present distress by meditating on God’s saving work in times past: “I will remember the deeds of the Lord; yes, I will remember your wonders of old,” (v. 11). Psalm 78 is a meditation on the past, both the rebellion of the people and the redeeming faithfulness of God. The next nine psalms look for rescue and redemption. Psalms 79 and 80 pray that the enemy may not mock the people of God. Psalm 81 promises blessing to the faithful. Psalms 82 and 83 affirm God’s sovereignty over all the Earth in the face of oppression. Psalm 84 focuses on the blessing of worship in the temple. Psalms 85 and 86 pray for the restoration of Israel and for all nations to come and worship with Israel. Psalm 87 is a strong prophecy of the nations’ coming to worship God. The last two psalms return to a sense of loss and crisis. From the very confident hope for the future in Psalm 87, Psalm 88 reaches the most profound expression of individual suffering and sense of abandonment in the whole Psalter. 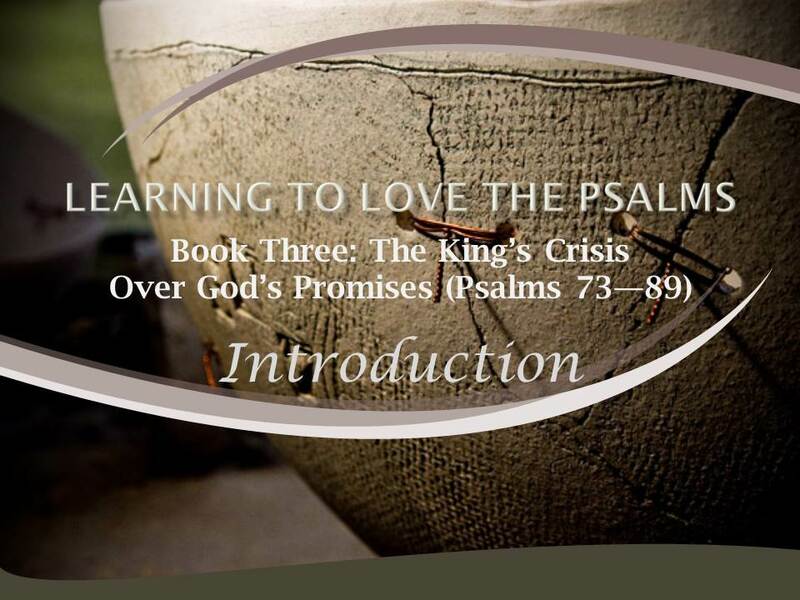 Psalm 89 concludes Book Three with a celebration of God’s past faithfulness and a deep bewilderment in the face of God’s apparent absence and indifference in the present. The crisis of faith in book Three does not culminate in despair. Some evidence of continuing faith is found in every psalm. Nevertheless, Book Three ends with great confusion and no resolution of the crisis. The end does contain a statement of praise, as does the end of every book of the Psalter: “Blessed be the Lord forever! Amen and Amen,” (Psalm 89:52). But the praise is not simply the result of confidence in God. It is also praise in spite of great uncertainty about the ways of God and his purposes for his people. What is the important difference between Book Three and all the other books of the Psalter? Why is this difference significant? How do the themes of personal and national struggle come together in Book Three? Is the crisis of faith in these psalms relevant to the life of the church today? Describe an occurrence of a crisis of faith in your own life or in the life of a loved one. In addition to the great theme of the crisis of faith, what four subordinate themes bind these psalms together? How is it that the crisis of faith in Book Three does not culminate in despair? Can one praise God in spite of great uncertainty about the ways of God and his purposes for his people?